We start our journey as we board our plane to Berlin, Germany. Meals and beverages are served in flight. Upon arrival in Berlin we are met by our Pathfinders representative who take us to our motor coach. We begin with a tour of this once-divided metropolis, visiting the elegant Ku’damm, the restored Reichstag Building, the Charlottenburg Castle, along with a picture stop at the monumental Brandenburg Gate, the Holocaust Memorial, and the 21-foot Victory Column. We then continue on to the Kaiser Wilhelm Memorial Church with its bomb-damaged spire and drive along Unter den Linden Boulevard, passing the State Opera House and Checkpoint Charlie. In the afternoon, we continue to Wittenberg, Martin Luther’s hometown for more than 30 years and birthplace of the Reformation. Dinner and overnight in Wittenberg. This morning we enjoy a guided walking tour of Wittenberg where we visit the Luther House, the home of Martin Luther and his family. We then visit St. Mary’s Church, a twin-towered Gothic church where Luther preached reform, got married, and baptized his six children! Finally, we visit the door of Castle Church, where Luther posted his “95 Theses,” launching the Reformation in 1517. 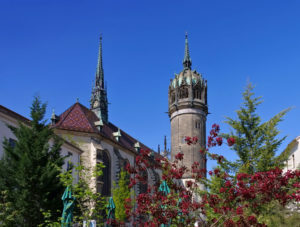 We continue on to Leipzig for a walking tour and a visit to the Thomaskirche, where Johann Sebastian Bach worked as a cantor. We end our tour at the market square that today is a site for celebrations and festivals, but once was the scene of executions and political demonstrations. Dinner and overnight in Leipzig. Today we depart for Erfurt, stopping in Eisleben where Luther’s life began and ended. We visit his Birth House and Death House Museums, as well as Sts. Peter & Paul Church, where Luther was baptized. Our last stop in Leipzig is at St. Andrew’s Church, where Luther preached his last sermon in 1546. This afternoon we drive to Erfurt, whose 36 churches, 15 monasteries and other ecclesiastical buildings have earned it the nickname “Thuringian Rome.” The beautiful Old Town preserves the atmosphere Luther must have experienced during his student days. A highlight of the day is an inspirational visit to the Augustinian Monastery, where Luther lived as a monk, and the unique Merchants’ Bridge lined with half-timbered homes on both sides. Dinner and overnight in Erfurt. Today’s excursion takes us to Eisenach, birthplace of Johann Sebastian Bach. Upon meeting our local tour guide, we visit Lutherhaus and The Church of St. George, where Luther was a choirboy and would later preach. We then visit the Luther and Bach Memorials, before heading to Wartburg Castle, where Martine Luther lived in disguise as “Knight George.” It was during this period that Luther translated the New Testament from ancient Greek into German in just ten weeks. Dinner and overnight in Erfurt. 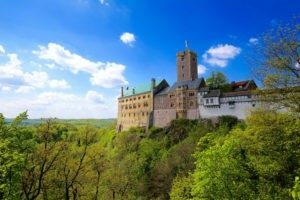 Today we drive south to Coburg and visit the fascinating Coburg Fortress, once the refuge of Luther during the Imperial Diet of Augsburg in 1530. As an outlaw of the Holy Roman Empire he could not attend the Imperial Diet of Augsburg, but instead spent his time translating the Bible and writing on Reformation issues. We then make our way to Wiesbaden for dinner and overnight. 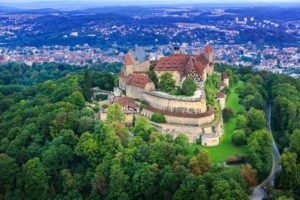 Our journey today takes us on a scenic Rhine Cruise past castle-crested cliffs, terraced vineyards, and half-timbered towns. 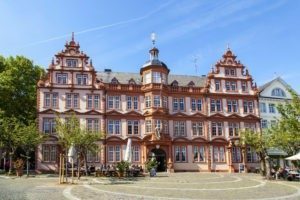 We make our way to Worms, the site where the Imperial Council passed judgment on Luther in 1521, and visit the Worms Cathedral, where Luther presented his case. We also visit Trinity Church and the Reformation Monument. We then continue on to Mainz to visit the Gutenberg Museum, which houses original copies of the first printed Bible. Dinner and overnight in Mainz. 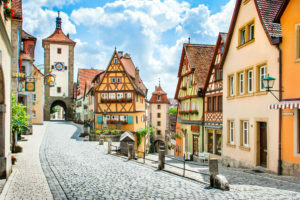 We depart Mainz this morning and journey to the medieval walled town of Rothenburg where a walking tour takes us to St. Jacob’s Church with its masterpiece “Altar of the Holy Blood.” Afterwards, there is ample time at leisure to shop for the town’s famed Christmas ornaments. Then it’s on to Nuremberg, the first town to accept the Reformation in 1525. On our walking tour we visit the Gothic St. Lorenz Lutheran Church ,where we pause for quiet meditation. Dinner and overnight in Nuremberg. 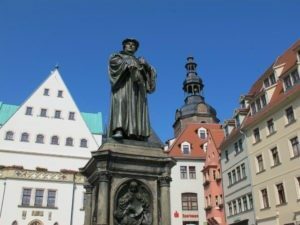 Today we travel to Augsburg for a guided sightseeing tours which reveals the city where Luther and his followers proclaimed their faith. After our tour there will be time at leisure before we travel to Wies. Upon arrivial in Wies, we will visit the Pilgrimage Church of Wies where in 1738 tears were seen on a dilapidated wooden figure of the Scourged Savior. This UNESCO World heritage site continues to be a place of Christian pilgrimage. Dinner and overnight near Wies. 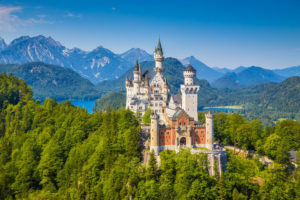 Today we will visit King Ludwig’s magnificent Neuschwanstein Castle, one of Germany’s most famous Castles and the inspiration for Walt Disney’s “Sleeping Beauty” castle. Our guide will take us through this fairytale site on a craggy outcrop high above a sparkling lake. After our tour we visit the Museum of the Bavarian Kings and enjoy a horse-drawn carriage ride. After time for leisure, we continue our journey to Munich for dinner and the night. 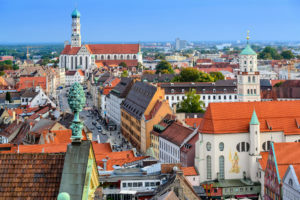 We begin our day with guided tour of the “Secret Capital” (Munich), which includes the Olympic Stadium, built for the 1972 Olympics and the 1,000-foot Olympic Tower, along with the Königsplatz, which was used by the Nazi’s for rallies during World War II. We then drive along the Ludwigstrasse and see the Bavarian Arch of Triumph and Field Marshall Hall. After a visit to the lively Marienplatz with the town halls, old and new, and the Gothic Frauenkirche, we enjoy a afternoon at leisure. We will gather together for a farewell dinner this evening. Overnight in Munich. 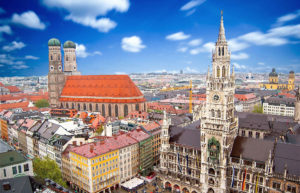 We transfer early to the Munich Airport for our flight home, taking with us wonderful and inspiring memories of our pilgrimage, which will be treasured and relived for the rest of our lives.